While the Type R may be a bit over the top with its styling, the lesser versions of the latest Honda Civic are definitely exceptional in their compact-car mission. 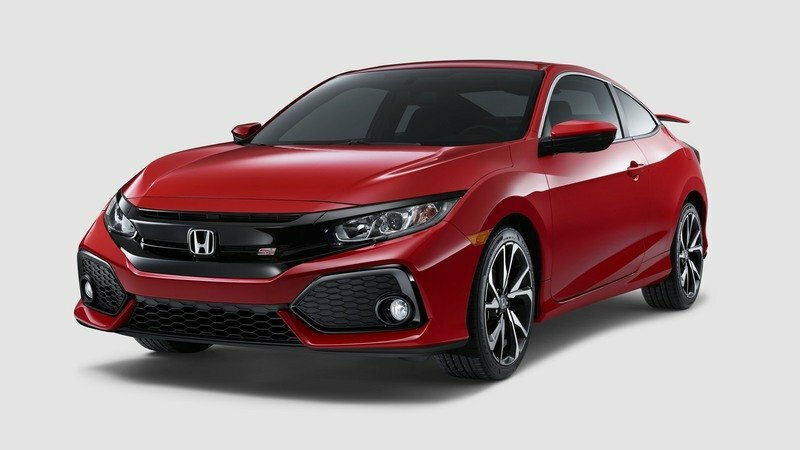 Now, Honda has revealed the 2019 Civic with new styling features for the coupe and sedan. As an added bonus the Sport trim can now be had on the Civic Coupe. The Honda Civic Type R has quite a legacy to its name, though none of it happened on American soil. Thankfully, that’s changed for 2017 as Honda has finally brought the Type R Stateside. In fact, its turbocharged engine is made in Ohio before being shipped to Wiltshire, England for assembly in the car. That’s right, this Japanese hot hatch has an American heart and is born in Britain. How’s that for multi-cultural? 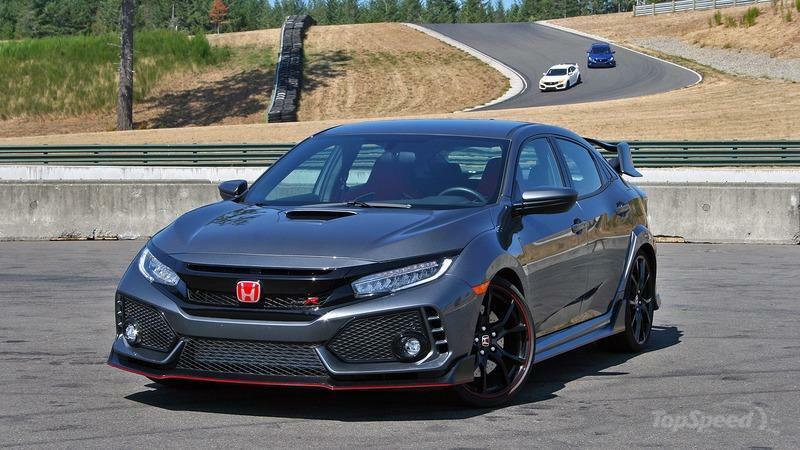 But more than that, the Type R’s appearance on U.S. soil means we finally have the chance to compare it to its fiercest rivals – the Ford Focus RS, Subaru WRX STI, and Volkswagen Golf R.
As it turns out, I’ve driven each of the competitors. Each are immensely fun and worthy of loads of respect over their engineering and outright impressive performance. The Type R joins those ranks with the same impressive level of technical wizardry and high-tech manufacturing techniques. I’ll dive into some of that, along with comparing it to the RS, Subi, and Golf R. It will be a fun ride, so read along. Continue reading for more on the 2017 Honda Civic Type R.
Performance vehicles are pushing the envelope beyond the imagination these days. Insane horsepower numbers and bleeding-edge technology contribute to ridiculous lap times and sub-four-second sprints to 60 mph. But more often than not, these all-out performance machines – think Chevrolet Corvette, Jaguar F-Type, and Porsche Cayman – are too compromised for daily living and cost a significant chunk of change. But imagine combining the impressive performance of a two-seater coupe with the functionality of a five-door hatchback and a reasonable price. That’s exactly what that hot hatch segment does. And now for the 2017 model year, Honda has launched its all-new Civic Type R. What’s more, Honda is bringing it to America for the first time. 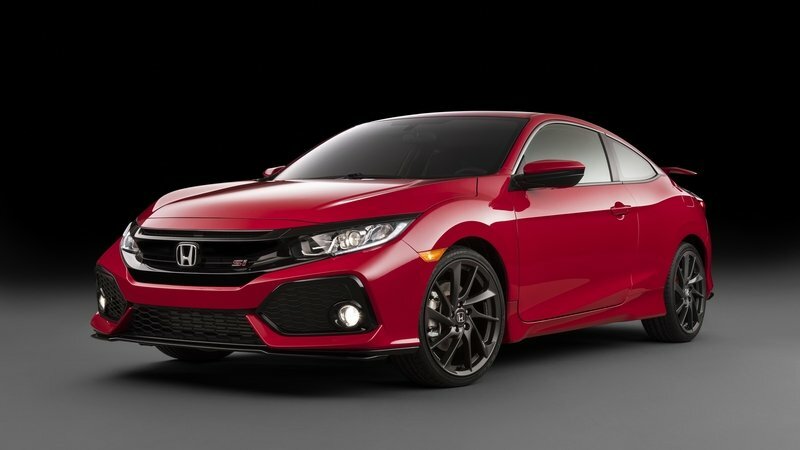 Based on the new 10th-generation Honda Civic, the new Type R adds power, a sophisticated suspension system, and functional aero to the family-friendly Civic hatchback. It’s like having cake and eating it, too. Now, the Civic Type R has some stiff competition. The 350-horsepower Ford Focus RS is the reigning performance king and the Volkswagen Golf R is the grown-up’s idea of a performance-minded hatchback. And if having a hatchback isn’t a priority but hitting the rally circuit is, there’s always the Subaru WRX STI. The Civic Type R sort of carves its own niche in the segment with an outlandish design, heavily bolstered front buckets, and the lowest starting price of the bunch, but mixes it with only 306 horsepower and the lack of all-wheel drive. To find out how the Civic Type R recipe tastes, Honda flew me to Washington State for time on a private racetrack and scenic drives near the Olympic National Forest. Here’s what I found. Honda finally brings its hot hatch Stateside! The go-fast goodies are matched with an aggressive styling. A huge wing, chin splitter, and air scoops all play into the sporty design. Production kicks off in the summer of 2017 with deliveries starting in the fall. Like all tenth-generation Civics, the Type R hails from Honda’s U.K. manufacturing plant in Swindon, England. Pricing starts in the mid-$30,000 range. The tenth-generation Honda Civic was launched in 2016, only five years after the previous generation was introduced. Alongside the standard model, Honda also redesigned the iconic Si version, until now the range-topping trim for the U.S. market. 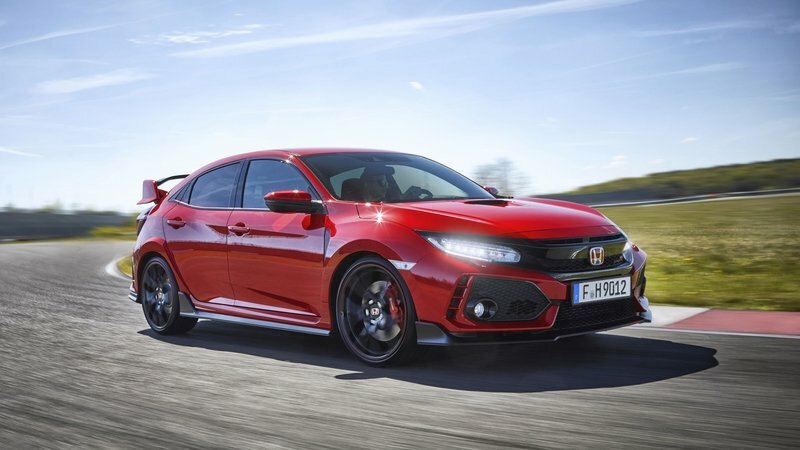 But while the hatchback has been relegated due to Honda having finally brought the Type R to North America, the Si sedan continues to sit at the top of the Civic range and act as Honda’s sole competitor for the likes of the Subaru WRX. Much like its predecessor, the new Civic Si sedan is a slightly beefed-up version of the standard four-door. There are sportier features on the outside, a few exclusive items and extra standard equipment on the inside, and a more powerful engine under the hood. The latter is brand-new and not a massive improvement over the outgoing unit, but it now motivates a lighter, more rigid car. Find out how it stacks against the competition in my review below. Updated 05/12/2017: Honda announced prices for the 2018 Civic Si sedan which will be put on sale at dealers nationwide on May 13, 2017. Continue reading to learn more about the Honda Civic Si sedan. The Honda Civic has long been a go-to car for practicality and honest transportation. Sure, there have been several hyped models with plenty of horsepower and fun, but the vast majority of Civics are built to handle the daily grind. Say what you will, but there’s merit in that endeavor. Well, Honda knew its customers needed something outstandingly practical, but mixed with some flare and excitement – sort of a witch’s brew of pragmatic and provocative. Enter the 2017 Honda Civic Hatchback. The Hatchback joins the Civic lineup for 2017, two years after the tenth generation debuted for 2015. It shares the spotlight with the popular Civic Sedan and fun-loving Civic Coupe. The trio now gives customers a choice in body style, while still delivering that Civic personality. All three ride on the same platform and share powertrain options. 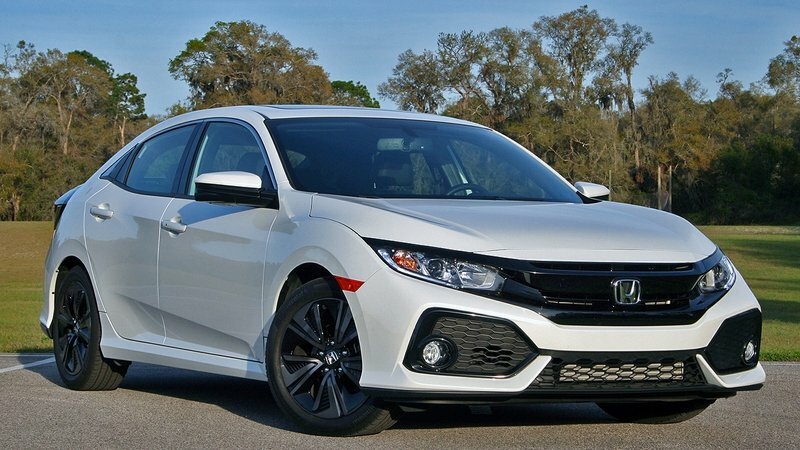 Since the Civic Hatchback is new, Honda sent an example to test for a week for evaluations. Our tester was the EX-L Navi trim and came equipped with Honda Sensing. Otherwise, the car had no options, giving a full taste of the Civic Hatch’s second-most expensive trim. Even still, the as-tested price only rang up $27,175. That’s not bad for a vehicle with crossover-like interior room, leather seats, tons of in-dash tech, all the latest active safety features, and a turbocharged engine that averages 42 mpg on the highway. Color us impressed. So how did the 2017 Civic Hatchback do? Keep reading to find out. The Honda Civic has been around for the last 45 years, and boy has it been a rollercoaster ride. Some of the more recent generations are considered flops, while others are regarded as much more. 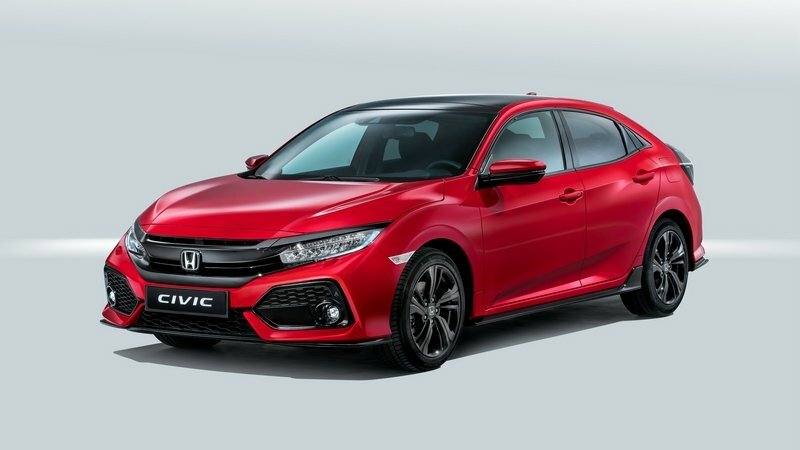 For 2016, Honda introduced the tenth-generation Civic, a model designed around Honda’s new compact global platform, featuring a fastback design and some serious improvement to the interior over previous models. Best of all, the Civic Type R hatchback is finally coming to the U.S., but so is a new Si. The new Si comes with a turbocharged engine for the first time ever, displacing 1.5-liter and delivering 205 horsepower. It’s a few ponies short of what everyone hoped for, but not all is lost. 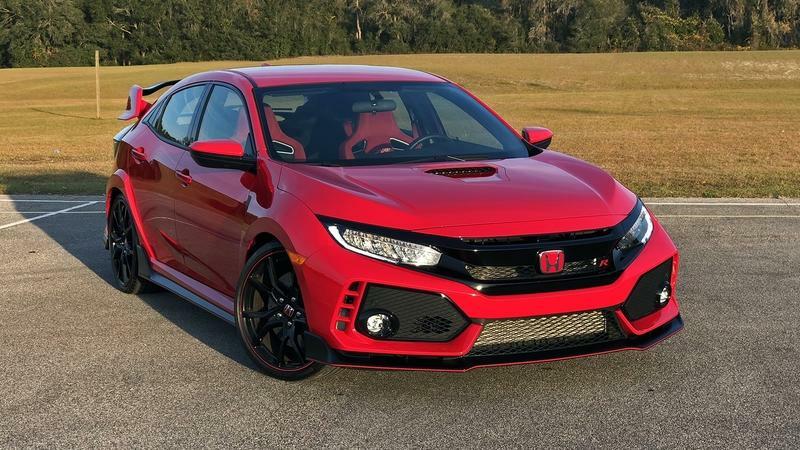 It also gets its own styling cues to set it apart, not only from the standard Civic but, from the Type R as well, making it a well-rounded model even if it doesn’t balance well between the standard Civic and Range-topping Type R.
Long story short, the new Si is the torquiest Si ever made. It weighs a bit less and includes more upscale features like active shock absorbers. There’s even a limited-slip differential turning the front wheels. Unfortunately, Honda isn’t offering it with all-wheel drive, but it does get a short-throw, six-speed manual transmission to help even things out a bit. Some exclusive features inside will keep it fresh in your mind that you sprung for something better than the Civic EX-L or the Civic Touring. But, let’s not get too far ahead of ourselves – the Civic Si is finally here in production form, so let’s take a closer look at it. There’s been a lot of excitement surrounding the new Honda Civic Type R, largely because it’s finally coming to the U.S. But what’s gotten lost in the understandable hype surrounding the new Civic hot hatch is the fact that it isn’t scheduled to hit dealerships at least until the latter half of 2017. For now, the predecessor to the 2017 model is still holding court, or at least just finished doing so since the last of current Civic Type R models has just come off the production line. And like most models that pull at our emotional heart strings, Honda has decided to commemorate the end of the current Civic Type R by launching a special edition version called the Black Edition. 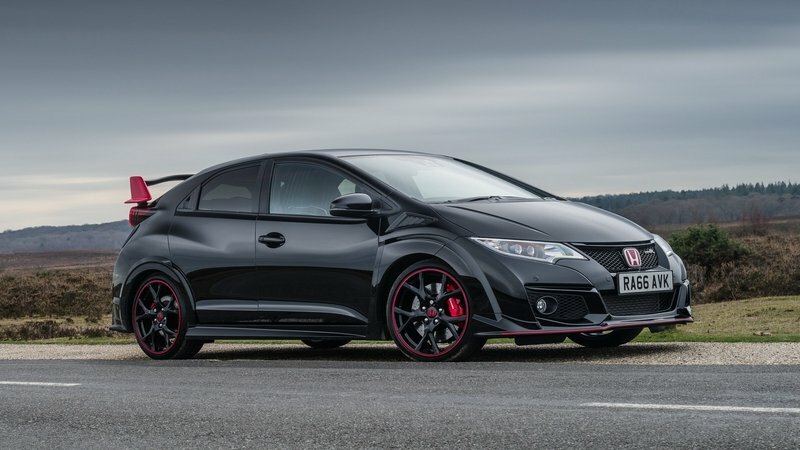 The model is formally known as the Civic Type R Black Edition, but let’s not get into any debates about that. The important thing is that it’s limited to just 100 units and with the how the hot hatch Civic is trending up in the eyes of collectors, it has the potential to be a diamond in the rough and turn into a sought-after car years from now. For now though, the Civic Type R Black Edition is what it is. It has a number of extra upgrades and features that sets it apart from all other Civic Type Rs that came before it. It also has features the same power and performance credentials, thanks in large part to a 2.0-liter turbocharged engine that packs an incredible 310 horsepower and 295 pound-feet of torque, enough to propel it from 0 to 60 mph in just 5.7 seconds before peaking at a top speed of 167 mph. That kind of performance even took the Civic Type R to the top of lap time records for front-wheel drive cars at the Nurburgring before it was usurped by the Volkswagen Golf GTI Clubsport S.
It’s safe to say that the Honda Civic Type R is one of the purest performance cars on the road today. Now it’s getting its own special edition model? Evidently, Honda knows how to end the production of the model on a high note. 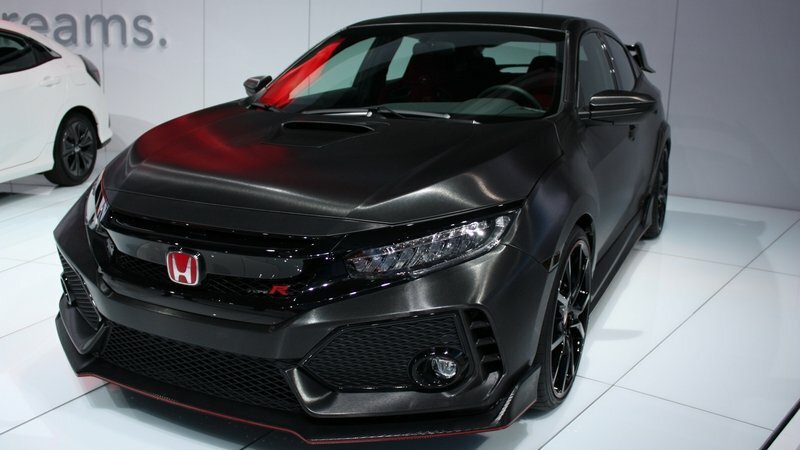 Continue after the jump to read more about the Honda Civic Type R Black Edition. The Honda Civic has always been a go-to for tuners everywhere, but more recently, the Civic hasn’t exactly been praised for its looks or design. All of that changed with the introduction of the 10th-generation model, and now we’ll be blessed not only with a new, track-ready Civic Type R, but a Civic Si in coupe and sedan form as well. Slated to launch in 2017 as a 2018 model, the Civic Si was unveiled to the world in a near-production-ready form at the 2016 Los Angeles Auto Show, which means it gives us a very good idea of what to expect when the road-going model officially debuts. 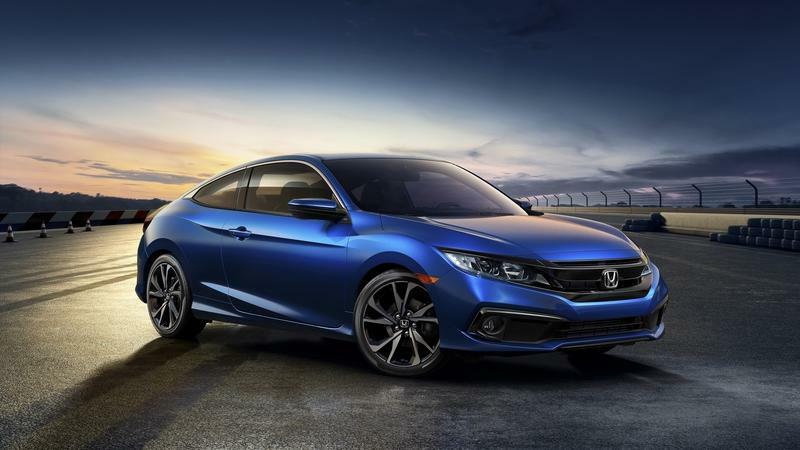 As a production model, the new Civic Si will spot a 1.5-liter, direct-injected, turbocharged four-banger that utilizes dual variable valve timing and mates to a six-speed manual transmission. Performance figures are unknown at this point, but Honda says the standard engine is both “high-performance and high-torque” Furthermore, it will come with active damper and steering systems, limited-slip differential, and 19-inch wheels wrapped in high-performance tires. A factory performance aero kit that has front and rear splitters will help tie together the package that is the Civic Si. The best part about the new Civic Si is that it maintains its own unique design compared to the standard road-going Civics and the Type R hatchback that broke the internet when it debuted. When it came to an Si model, we all kind of expected to see a lot of Type R styling in a coupe or sedan body form, but Honda did things right and gave the Si its own identity. If you like good performance and awesome looks without having to go hatchback, the Civic Si Coupe or Sedan will definitely be for you. With that said, let’s talk about the upcoming model and what we can predict about it based on the prototype that Honda brought to the Los Angeles Auto Show. 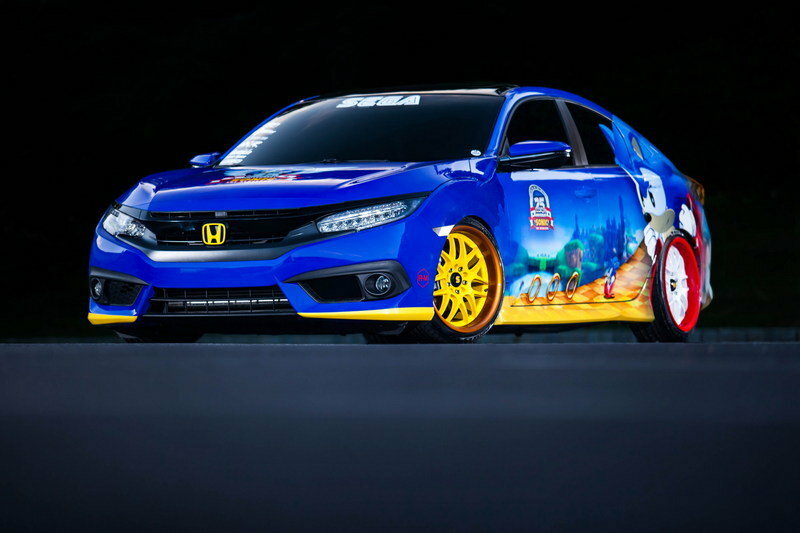 Honda is using the 2016 SEMA Show to introduce its new race car for the Red Bull Global Rallycross. Developed by Olsbergs MSE, a Swedish racing team that also designs race cars, the new GRC-spec Civic Coupe will replace the car that ran against Volkswagen, Ford, and Subaru in the 2016 season, placing third in the manufacturers’ championship. 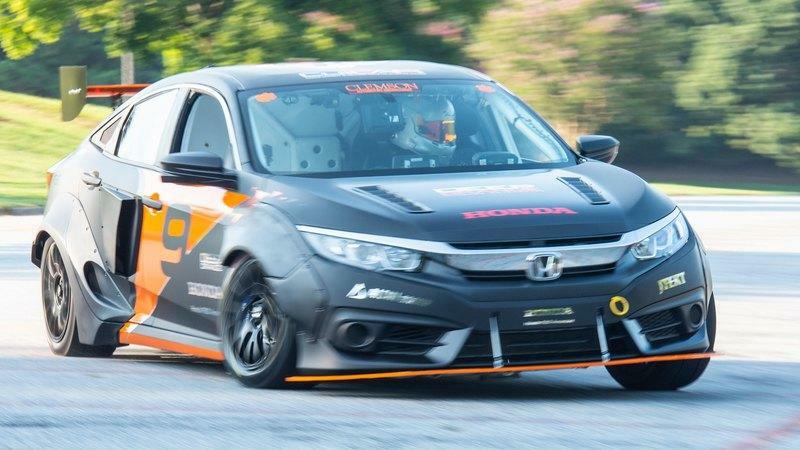 The designing team also received input from Honda Performance Development (HPD), the brand’s racing division, which has created many successful race cars over the last few years. 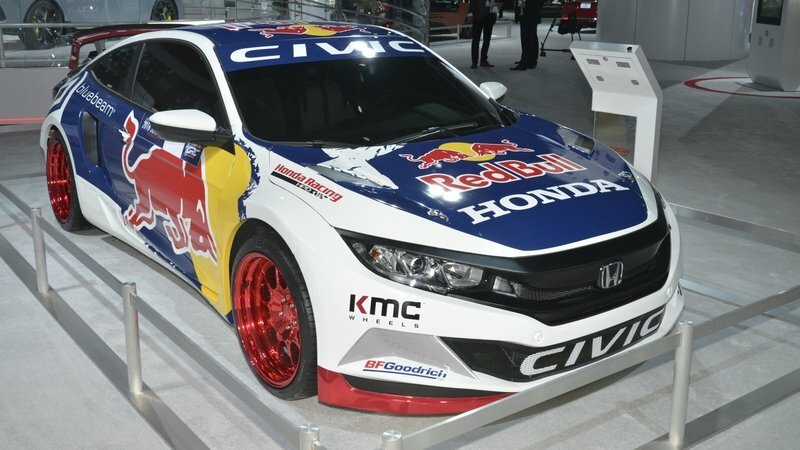 Honda is a pretty new entry in the Red Bull Global Rallycross, itself a recently established sport, having been launched in 2011. The Japanese brand joined the competition last year, also with a race car based on the Civic Coupe. The compact raced against GRC-spec versions of the Ford Fiesta ST, Subaru Impreza WRX STi, Volkswagen Beetle, and Hyundai Veloster. Honda and Olsbergs MSE finished the season third and are hoping to do better in 2017. Not much is known about the new race car at the of this writing, but Honda did release a batch of photos and just enough info for a short review. We should find out more at the 2016 SEMA Show in November so make sure you stick around for updates. 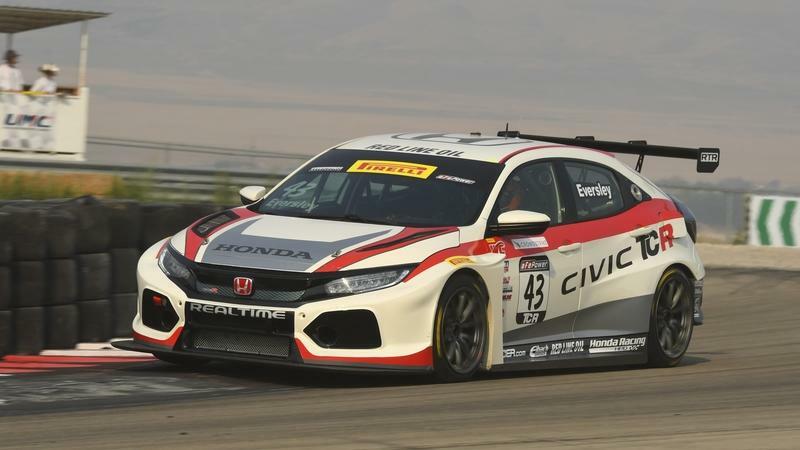 Continue reading to learn more about the Honda Civic Coupe GRC Competitive Race Car. If you read our review of the 2016 Honda Civic Coupe you probably know where we stand when it comes to Japan’s new two-door. Powerful enough to give the Toyota 86 a run for its money and stylish enough to go head-to-head against the BMW 2 Series, the new Civic Coupe delivers great bang for the buck and solid performance next to excellent fuel economy. But, we also think there is room for improvement, especially for drivers looking for a more aggressive design and a lot more power. This is where tuning shops such as MAD Industries come in. Known for modifying everything American from Mustangs to large trucks and SUVs, MAD Industries has also created upgrades for several Honda and Acura models in recent years. At the 2016 SEMA Show, the shop will unveil yet another Honda-based package, this time around for the new Civic Coupe. The project is more about the looks and the interior than added horsepower — at least based on the lack of drivetrain information — but it’s a solid package if you’re looking to enhance your bone-stock Civic. 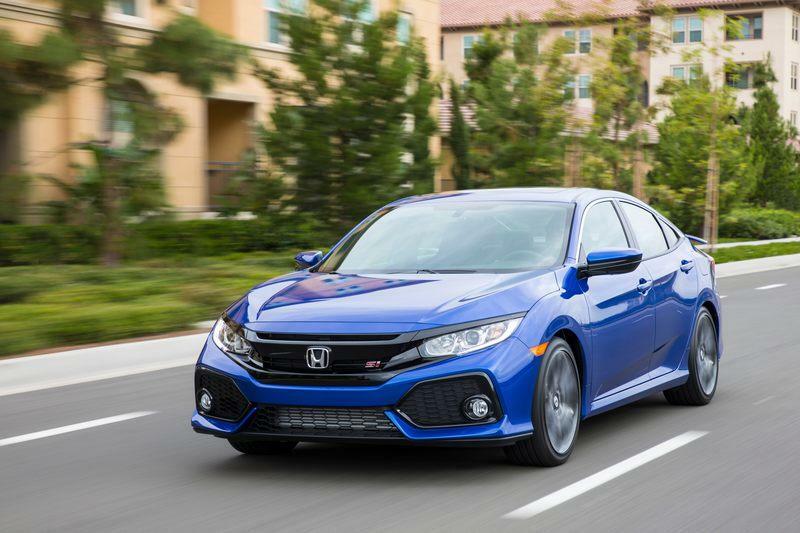 Developed to "showcases the versatility and fun factor behind the all-new Civic Coupe," the package is solid proof that no matter how sporty a standard model is, there’s always room for more aggressive exterior bits and a flashy interior. 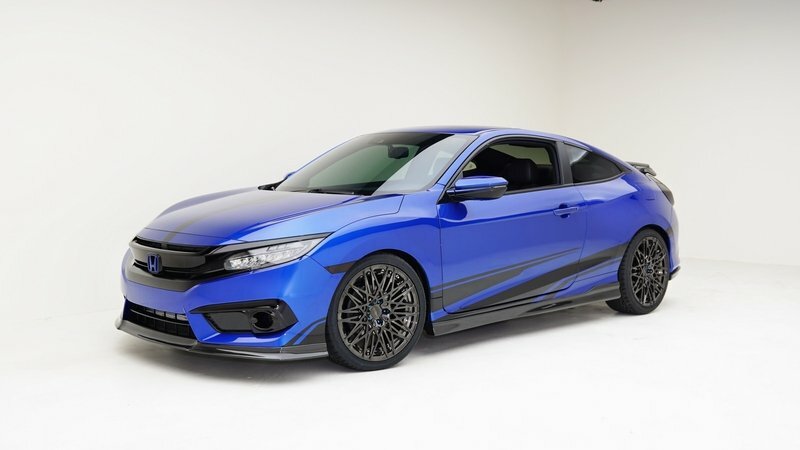 Continue reading to learn more about the Honda Civic Coupe By MAD Industries. Finally – the Civic hatchback is coming back to the U.S. When Honda released the revamped tenth-generation Civic earlier this year, it looked like the H Badge had redeemed itself for the lackluster ninth-generation vehicle that came before, blessing the ubiquitous compact nameplate with fresh underpinnings, an updated cabin, and new powerplant options. Now, there’s a five-door hatchback on the way, and thankfully, it offers all that good stuff, plus the option for a true-blue six-speed manual transmission to mate with the 1.5-liter turbocharged four-banger. Best of all, it’s coming to the U.S. Most performance enthusiasts will want to wait until they can get their hands on the 168-mph Civic Type-R, but if waiting just isn’t an option (or 168 mph seems a bit unnecessary), then the plain-Jane hatch could be a viable alternative. It’s got the same platform as the R, but doesn’t bash the sensibilities like the top-spec boy-racer special. Thing is, U.S. consumers usually go for crossovers, not hatchbacks. Can the tenth-gen Civic be the exception to the rule? Update 09-16-2016: Honda has finally announced the details about the all-new Honda Civic Hatchback. Check out our updated review below to learn all about it. Comic-Con has kicked off for 2016 and, needless to say, things there are pretty wild. This year just happens to mark the 25th anniversary of Sega’s legendary blue hedgehog, Sonic, and the game that has always been a flagship for Sega. If you’re wondering why I’m talking about a video game character here on TopSpeed, your concern wouldn’t exactly be unwarranted as – outside of his relentless speed – he really has nothing to do with anything cars, right? Well, that isn’t exactly true, as Sega and Honda have teamed up to bring a special version of the Honda Civic to Comic-Con this year. And, believe it or not, it’s all about the fast-footed hedgehog we’ve all grown to love. The special-edition model is based on the 10th-generation, 2016 Honda Civic Touring Sedan and features a number of special design cues that pay tribute to Sonic himself. As such, the car comes standard with a number of features from Honda, like a fuel efficient engine, plenty of safety and driver assistant technology, and an infotainment system that features Apple CarPlay and Android Auto, among other things. So, with that said, let’s take a good look at the Sonic Civic and what went into making the car that pays perfect tribute to Sega’s flagship character. Continue reading to learn more about the Honda "Sonic the Hedgehog" Civic. 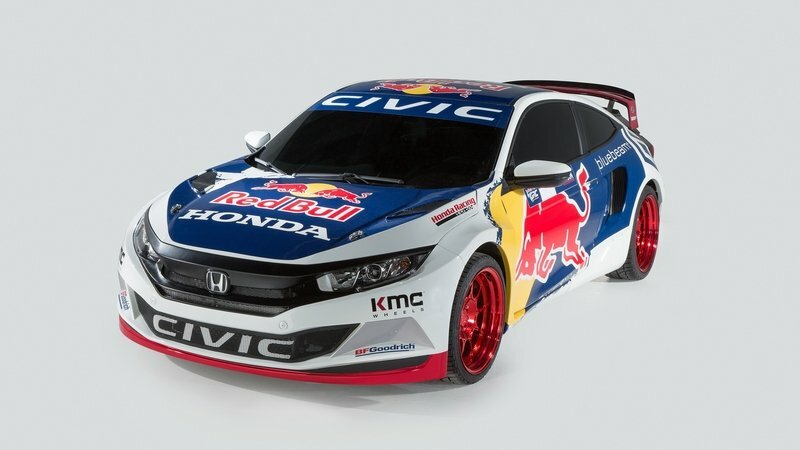 Continue reading to learn more about the Honda Civic Red Bull GRC.